Much of the ranting surrounding the abominable "Foreclosure Prevention Act of 2008" dealt with "stabilizing" the housing market - to stem the decrease in the prices of houses. This post is an attempt to show why that is not possible. 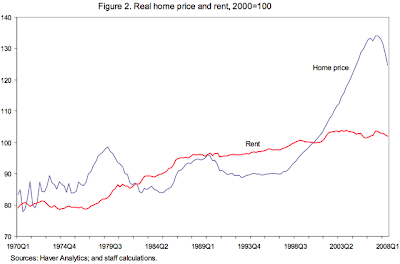 Real house prices will inexorably drop back to somewhere around where they were in 2000. They can't do anything else, because it was only funny-money loans, which are no longer available and which will never be available again, that allowed the startling increases of the 2002-2006 to occur in the first place. I'm not shorting any housing related stock - I don't play the markets at all as, in their current state, they are senseless or manipulated or both. In fact, I wish houses would hold their value, as, due to ignorance of the history of housing prices and other negligence, I cleverly bought right at the top of the peak. So I wish I was wrong. This picture graphs the ratio of median house price to median family income over more than 30 years. It shows that for more than 20 years, from 1981 to 2001, that ratio hovered right around 2.8 - so a family that earned say $50,000 could afford a $140,000 house. Reducing aggregates of numbers (the incomes of all families; the prices of all houses) to single numbers (the "median") is fraught with statisitical issues, especially in times of rapid change. But that fact that this ratio stayed so constant for so long implies strongly to me that it validly means something. And that something is this: with conventional fixed-rate 30 year mortgages in the 5-7% interest rate, this is as much house as families could afford relative to their income. The usual measure is to take the mortgage payments for given loan (Principle and Interest), add in the Taxes and Insurance (so the accronym is PITI) for the house and divide this into the gross income. This yields a debt-to-income (DTI) ratio, and this number is critical to determining whether a particular family can afford a particular loan. DTI of .28 to .35 were once considered the upper limit. The short story is funny-money loans allowed people to buy houses they could not afford, by making the DTI ratios look lower than they actually were. Alan Greenspan lowered the Fed Funds rates to 1%, and eventually this caused other bonds to return less, forcing investors looking for more return to look elsewhere. That flow of money moved into mortgage securtization where it produced lower mortgage rates. Lower mortgage rates produced lower monthly payments (and therefore DTI), which allowed people to buy more house relative to their income. But eventually this phase ended - the Fed raised rates and by 2005 they were back in the normal range. But by this point the boom was on - and more to the point, while the game was afoot, all the referees were bribed or blind drunk. Everybody was making so much money that anything that could be done, would be done to keep the game going. So, because the the models all assumed that prices would continue to go up, and because the Banks and mortgage brokers were selling the loans through securitization and therefore didn't care what happened after the loan was sold, and because the only thing the buyers were looking at was FICO scores and DTI (and as time passed, they stopped even looking at FICO scores), ways were found to manipulate the DTI. First came the Adjustable Rate Mortgage (ARM) - with an artificially low initial teaser rate the reported DTI was much lower than it would be when the teaser period expired. People bought houses using these because they didn't understand, or because they were given the mantra of: "house prices always go up, so you can always refinance or sell". The initial DTIs looked good to the investors, and the post-teaser rates looked even better to the investors, so they went for it to - invoking the same mantra as justification for the too-good-to-be-true returns. Addtionally, loans were made where the family income was subject to little or no confirmation. Offically called 'Alt-A' or 'low-doc' or 'no-doc' loans, but widely referred to as "liar's loans", these allowed the DTI to be artificially lowered from the other end, as the family's income could be inflated, either by lying on the part of the home-buyer or by the people handling their paperwork. Finally, the originators and securitizers stopped requiring any down-payment. So not only were home-buyers buying houses all out of relation to their income, but speculators - invoking the mantra "house prices always go up" - could buy nultiple houses. Enter "Casey Serin" into google for one of the more notorious examples. The speculation helped end the cycle more decisively than it might otherwise have. In 2006, when the house price increases leveled out, there was a sudden uptick in people who stopped paying within the first 3 monthly payments. This is called Early Payment Default, and when this happens, the securitizers have the right to "put back" the loan to the originator - in these cases, not usually banks with any money but mortgage brokers who existed off their fees and had no capital of their own. These EPDs therefore caused the first great implosion of subprime lenders. When the securitization market - where investors would endlessly, mindlessly fund these funny-money loans seemingly forever - died in August 2007, the boom was done and the bust was baked in. Because we are now back to the regime where you need to put money down, you need to verify your income, everybody is making conventional loans only - no more screwing with the DTI - where they are making loans at all. So, even if people wanted to pay 2005-2006 prices - they can't. Unless they are filthy rich, it's back to 2.8 times median income - and the dirty little secret of the Bush "recovery" - unlike previous recoveries - is that real income has stayed flat or dropped since 2001. These both compare the cost of renting to buying a residence. Once again, we see how totally out of whack the 2000-2005 period is. 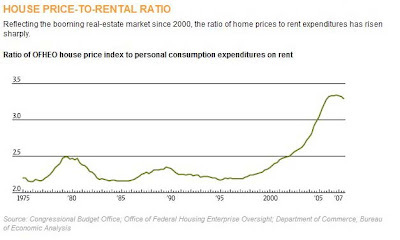 Once again, I state that this happened because of funny money available for purchases, but not for rents. And once again, these show that house/condo prices would need to fall until the relationship between purchase and rent reflects that of approx 2000 for things to be back in their historical relationship. This is because the current disparity means that buying housing to rent it is a losing deal - so all investors who are awake will not enter this market. And those making the decision to buy or rent on hard economic grounds, rather than any sentiment toward ownsership, will also wait until the price to buy has fallen. House/condo prices will fall. It will happen, because it can't not happen. Will This Be On The Ballot? Obama, Chicago and Cheyenne - WTF? The Real Reason We Went to War in Iraq?